pads/papers as fast as I could get them down. Or if they did manage to leave the papers in place, they would walk all through their "business" after they were through and have a mess all over their paws. Life with puppies has become less messy since discovering the litter box method. We use a rectangular, shallow plastic storage box, purchased for around $5.00, bought at a dollar store, or Wal-Mart along with pellet cat litter called "Yesterday's News" made from recycled newspapers. I get the "yesterday's news" at PetSmart. The litter box is useful for people who work and can't let the puppy out of it's crate during the day, or for times when the owner has to be away from home for a few hours ata time. 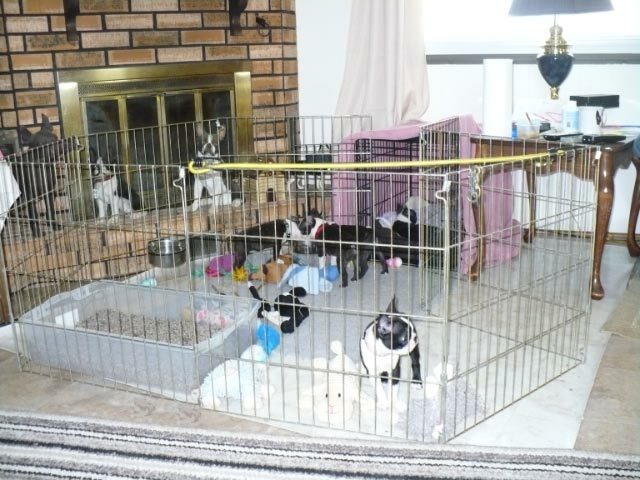 The puppy can be confined in an exercise pen in a room in the house, along with the litter box, bed, toys, food and water, and be perfectly fine until the owner returns. It is also helpful for allowing you to sleep through the night without being woken up to take the dog outside to potty! We love taking the litter box along to hotels, especially when we go to shows during the winter months, or when there is rain expected. Our dogs remain trained to use the litter box, or to potty on a leash, in an ex-pen, or outside in the yard. Versatility is always a bonus! Below are a few links with further information on Litter Box training your dog, but our puppies will already be used to this method, so that is a jump start for the new owners. Also, there are many different kinds of dog litter boxes, from basic to fancy. The main thing is to contain the waste as effectively, and in as sanitary a method as possible. Here are 5 week old Boston puppys sleeping after eating mushy puppy food with a litter box in the front of their set-up they can use when they wake up! After they get the idea of using the litter box, then you can expand the size of the x-pen or the set up you have them in and they'll still use the litter box. 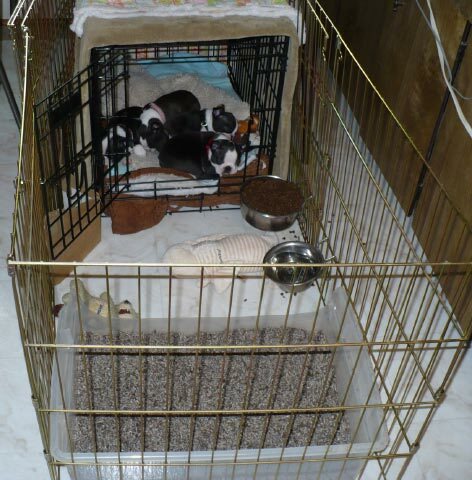 Here are 7-8 week old Boston puppys in their expanded x-pen or the set up you have them in and they'll still use the litter box.